A newspaper article from FloridAgriculture, a magazine published by the Florida Farm Bureau (FFB). The bureau was formed in 1941, when Florida Citrus Growers, Inc. was reorganized as the Florida Farm Bureau, affiliated with American Farm Bureau Federation. The FFB represents Florida farmers in the Florida Legislature, studies agricultural practices, and offers insurance products for its members. This article discusses the history of Lake Apopka and its pollution, and describes research findings by Dr. Richard B. Forbes, a chemist working at the Sanford Agricultural Research and Education Center. The article also describes efforts by the Central Florida Agricultural Institute (CFAI) to stop pollution in the lake. The CFAI was a non-profit corporation formed to represent the Zellwood farmers operating on Lake Apopka's north shore and investigate potential methods to reduce pollution. The article claims that the CFAI had donated $50,000 to the Sanford Agricultural Research and Education Center and was working on reservoir systems to prevent polluted discharge water from entering the lake. Lake Apopka is one of Florida’s largest lakes and was once considered to be one of the world’s best lakes for bass fishing. The lake’s sport fish population began to decline in the 1960s, with major die-offs occurring almost yearly. The lake’s problems are generally considered to be the result of over-nutrification from various sources. Twenty thousand acres of wetlands bordering the lake’s north shore were drained in the 1940s and used for highly fertile "muck farms." These farms were routinely flooded to protect the fragile soil, and the fertilizer and pesticide-laden water was then discharged back into the lake prior to each growing season. Other sources of pollution include discharge from citrus processing operations, as well as treated wastewater from sewage plants. The nutrient-rich discharge promoted algae growth in the lake, turning the water to a green color, and blocked sunlight from reaching aquatic vegetation, which provided food and habit to the lake’s fish population. The lake’s bottom soil became increasingly “mucky,” also disrupting aquatic vegetation from taking root. Photocopy of original magazine article: White, Earl. "Lake Apopka: Operation Cleanup." FloridAgriculture, May 1973: binder 1973, Friends of Lake Apopka Archives, Ginn Museum, Oakland Nature Preserve, Oakland, Florida. Digital reproduction of photocopied magazine article: White, Earl. 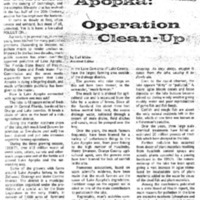 "Lake Apopka: Operation Cleanup." FloridAgriculture, May 1973. Binder 1973, Friends of Lake Apopka Archives, Ginn Museum, Oakland Nature Preserve, Oakland, Florida. Originally created by Earl White and published by FloridAgriculture. Copyright to this resource is held by FloridAgriculture and is provided here by RICHES of Central Florida for educational purposes only. "History of Florida Farm Bureau." Florida Farm Bureau. Accessed June 8, 2016. http://www.floridafarmbureau.org/history/. White, Earl. “Lake Apopka: Operation Cleanup.” RICHES of Central Florida accessed April 20, 2019, https://richesmi.cah.ucf.edu/omeka/items/show/7537.